Meanwhile, patients from all over the world are traveling to Vienna for medical treatments, as Vienna has developed into a location of top medicine. In Vienna, a wide range of medical therapies and surgeries of all kinds is offered. But also after-care in the form of rehabilitation after medical interventions and births are very popular with foreign patients. In our apartments you can enjoy the tranquility and privacy of your own home where you can relax from your treatments and appointments. You simply place a request on our homepage for your desired apartment or tell us the address of your hospital and we tell you which apartments have the best accessibility for you. Do you have to go to the hospital for treatments or preliminary appointments on the first day of your stay and will arrive later at the apartment? No problem for us. We offer a flexible keybox Check-in, so you can arrive anytime, without a long waiting. All information about the way to us and the Check-in procedure will be sent beforehand via e-mail. If you prefer a personal Check-in, our team will be glad to welcome you at the apartment. 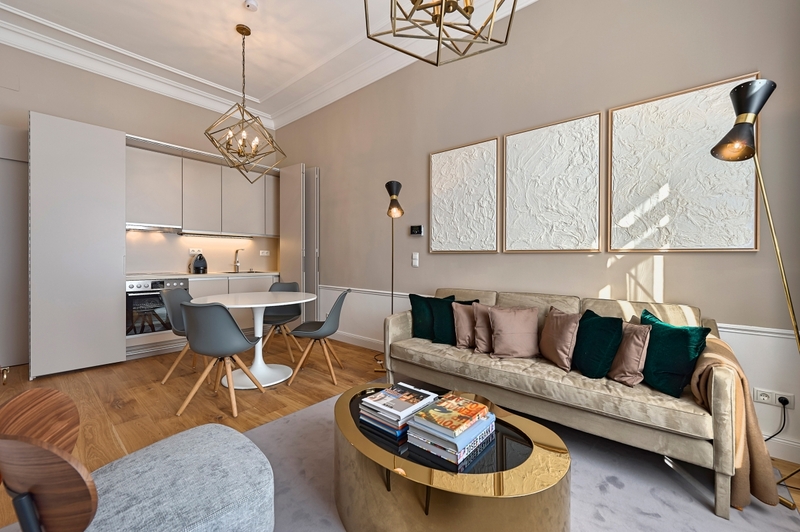 Our apartments are all furnished to a high standard with a mix of modern and vintage. Our beds are handmade boxspring beds for highest sleeping comfort, because we understand that after a busy day full of appointments you want to sleep well. Our bed linen and towels are cleaned according to standardized, disinfecting procedures and yet environmentally friendly. We can provide baby cots, baby chairs and baby bathtubs for free. All kitchens are fully equipped, from Nespresso coffee machine over toaster, kettle, stove, oven, cutlery, crockery and kitchen utensils. Each of our apartments has its own internet connection. Our internet is unlimited and available in high quality so you can surf at high speed anytime from home. You can pay conveniently by direct debit, credit card, cash or bank transfer. We can hand over your invoice to you personally, send it by e-mail or even leave it in your apartment, whatever is convenient for you. Of course, our invoices are issued with VAT, so you can take them into your tax declaration. We know that the duration of medical treatments can vary widely and that the course of recovery may take longer than expected at the beginning. Just let us know and we can easily extend your stay. Especially with health restrictions and strong involvement in scheduling you maybe have no time to take care of the cleaning of your apartment. We usually offer weekly cleanings including linen change. If you need the cleanings more often, we will gladly organize it for you.